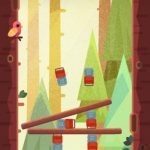 Brio – Don’t Fall is a new casual game from The Blu Market for Android and iOS devices, and it should appeal to those fans of super-simple, yet often super-frustrating games with minimalist mechanics that add to their addictiveness factor. This game is an “extremely addicting and stupidly simple ball game”. It’s about bouncing from left to right and platforming your way around the levels, while making sure not to fall into the gaps when the platforms fall down. 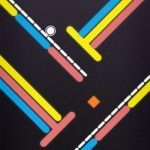 There are different levels in the game, and if you mess up in one of those levels, meaning bump into a spike or any other obstacle, that’s it for your run and you’re going to have to start from square one. 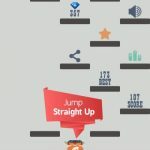 That alone should give you an idea of what to expect in Brio, but if you want to make your runs longer and be less frustrated by the outcome of your runs, we suggest checking out our list of Brio – Don’t Fall tips and tricks. You can bounce straight up if you bounce in the middle of one of the platforms, with your finger currently released from the screen. Bouncing off of a corner on one of the platforms will ricochet you toward the opposite corner – that’s left if you bounce right, or right if you bounce left. Talking about scoring, successful bounces are worth one point. If you grab yourself a power-up, that earns you an extra five points each. These power-ups are hexagon-shaped white objects, and appear randomly in the game. You will always be within grasp of those power-ups, even if they tend to float around randomly. The spikes will start appearing later during your runs, and will normally appear once you reach about 10 to 15 points. There’s no second chance here – if you hit a spike, that’s the end of your game. That means you should be very, very careful not to hit the spikes, and only try bouncing off the platforms that do not have any spikes. As the spikes are colored white, you can’t miss them – avoiding them, however, may be a bit tricky at first. Unfortunately, the ads can be a nuisance, so it’s understandable if you want to play the game offline so you can turn off the ads. 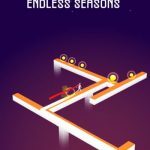 But since it’s always best to do the developers a solid, you may also want to purchase the game by choosing the No Ads option once you load up the game; you will then be prompted to buy the game like you normally would in the App Store or Play Store. As is the case in other casual games, practice makes perfect in Brio. But playing too long may leave you feeling frustrated with your abbreviated runs and low scores. If you find yourself feeling that way, then take a breather for about 30 minutes or so, in order to collect yourself and return to the game eventually, feeling mentally and physically refreshed. This would be our list of tips and tricks for Brio – Don’t Fall. We hope you’ve enjoyed our collection of hints and they help you complete more levels in the game.